The automotive-style dash was appreciated by the judging panel. The Peugeot Design Lab for Beneteau won the Janus Prospective Award from the French Institute of Design for its Sea Drive Concept during a ceremony held December 17 at the Quai d’Orsay in Paris. 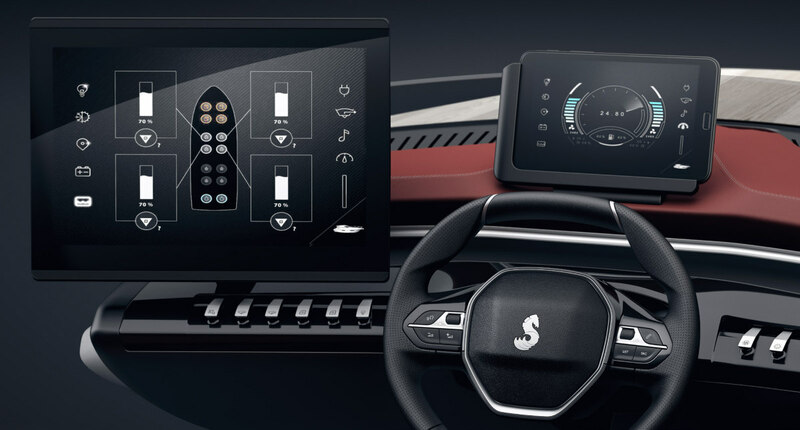 The nautical dashboard was inspired by the Peugeot i-Cockpit and Ship Control technology developed by Beneteau. The jury also recognized the cooperation between automotive and nautical designers to create what could be the future of marine dash panels. Beneteau says the concept bridge maximizes the ergonomics, agility and control for a captain with a blend of touchscreen and physical buttons. The Ship Control interface is an on board computer that assists in navigation and controlling on board systems including the engines, batteries, air conditioning, lighting and stereo. It can be run with the screen at the helm or with a detachable tablet.